“Unlike windows, birds are disappearing in North America.” – Department of Bird Safety, 2014. Sessional faculty member Genevieve Raiche-Savoie and alumnus Jesse Garbe ('04), are seeing spots ─ with good reason. The pair comprise The Department of Bird Safety, an art/design collective who produce socially engaged art that raises awareness about issues concerning endemic migratory birds. They’re also members of the City of Vancouver’s Bird Advisory Committee and the artists-in-residence at the Queen Elizabeth Park field house. 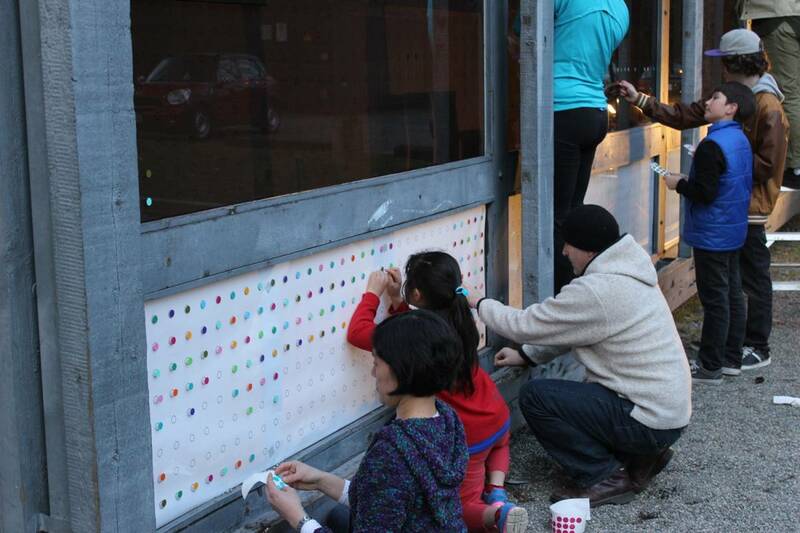 In their latest project, which launched March 4, at the West Point Grey Community Centre, Savoie and Garbe worked with community members to apply close to 4,000 coloured dots/visual markers to the exterior of the centre's windows in an effort to deter birds from colliding with the building, whose main facade is largely composed of windows. This temporary installation of dots takes visual notes from the artist Damian Hirst’s spot paintings with markers created by Feather Friendly, a bird collision company specializing in glass deterrent. Says Raiche-Savoie, "As artists, our goal is to challenge anthropocentric concepts of viewership and to create artwork that takes into account both human and non-human viewers." According to the City's Vancouver Bird Strategy, released in January 2015: Over 250 species of resident, migratory and over-wintering birds are regularly observed in Metro Vancouver. The high visibility and auditory presence of birds creates an experiential link with nature that can foster stewardship of the natural environment and enrich the lives of Vancouver’s citizens. Birds also provide important ecosystem services in the form of pest control, pollination and seed dispersal. However, according to The State of Canada’s Birds, 2012 report, habitat loss due to human settlement, industry and forestry has caused a 35% decline in characteristic bird species in the Pacific Coast region of Canada since 1970. Vancouver has a responsibility to reduce the impact that urbanization has on birds along the Pacific Coast. Up next for The Department of Bird Safety ─ an expansion of their housing project with a goal of housing birds both safely and affordably. Watch for their upcoming curated exhibtion at The Roundhouse, April 11 - May 12, 2015, where they will share information on how architects and designers can incorporate bird-friendly design into their projects.